The FX806 is a PMR Audio Processor intended primarily to operate as the “Audio Terminal” of Radio Systems using the DBS 800 Digitally-Integrated Baseband System. The FX806 is a half-duplex device whose signal paths and level setting elements are configured and adjusted by digital information sent from the Radio µController using “C-BUS” hardware and software protocol. Selectable transmit or receive input paths. Transmit voice signals pass through microphone pre-amplifier, voltage controlled gain (VOGAD) and highpass filter stages. Received audio is de-emphasised. This initial audio, after in-line gain adjustment, is available for switching to either external audio processes (such as scrambling) or internally to the Main Process stages. Conditioning for Input or External Process signals with pre-emphasis, high and low pass switched capacitor filters and a transmitter deviation limiter. Main “voice audio" for transmission is combined with signalling and data from other DBS 800 microcircuits, to provide the composite (in and out band) signal for the digitally adjustable Transmitter Modulation Drives. Received audio is level (volume) adjusted for output to loudspeaker circuitry. Signal-level stability and therefore output accuracy of the FX806 is maintained by a voltage-controlled gain system using selectable signal—level detectors. Signal levels can be dynamically controlled to provide dynamic compensation for such factors as temperature drift, VCO non-linearity, etc. FX806 audio output stages can be completely disabled or the whole microcircuit placed into a “Powersave” mode, leaving only clock and “C-BUS” circuitry active. 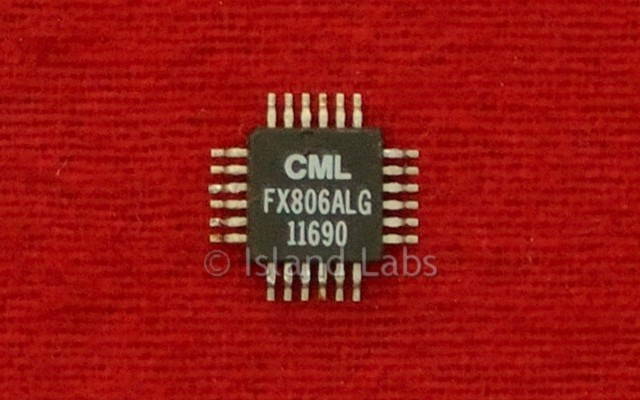 The FX806 is a low-power, 5-volt CMOS integrated circuit and is available in 24-pin DIL cerdip and 24-pin lead plastic SMD packages.